North Central College is Methodist college with 2797 students located in Naperville, IL. What is a typical North Central College student like? Describe the type of person that should attend North Central College. A student who is part of clubs, manages good grades, works part time, and sometimes work with professors. Any student who is determined and passionate is a person that should attend North Central College. What are the top 3 reasons someone should attend North Central College? The staff is amazing. Some students actually do studies with professors and then move on to their own studies. What was a typical North Central College student like in high school? Describe the type of person that should attend North Central College. Well, a vast majority of the men are involved in athletics at North Central College. These men were douchebags in high school and thought they were top dog. They still feel that way. The women are more focused and respectable. North Central College is making plans to celebrate its Sesquicentennial! The academic year 2011-2012 promises to be a memorable milestone for the College, with special events, publications and displays on campus designed to remind alumni, students, faculty, friends and community members of the rich traditions that began with the founding of Plainfield College 150 years ago in 1861. 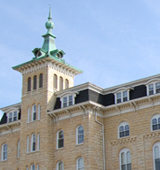 North Central College is an independent, comprehensive college of the liberal arts and sciences that offers more than 55 undergraduate majors and graduate programming in six areas. Located in the Historic District of Naperville, Illinois, North Central College is just 28 miles west of Chicago's Loop. With more than 2,700 undergraduates and 260 graduate students, North Central College is committed to academic excellence, a climate that emphasizes leadership, ethics, values and service, a curriculum that balances job-related knowledge with a liberal arts foundation and a caring environment with small classes. North Central College is affiliated with the United Methodist Church. North Central College is a community of learners dedicated to preparing students to be informed, involved, principled and productive citizens and leaders over their lifetime. The College is committed to academic excellence; an academic climate that emphasizes leadership, ethics and values; an innovative, integrated and internationalized curriculum that balances practical knowledge in job-related fields with a liberal arts foundation in writing, speaking and thinking; and a caring environment with small classes and one-on-one instruction. What are the top 3 things that students do for fun at North Central College? The average student pays $22,715 for tuition, fees, and other expenses, after grants and scholarships. Total stated tuition is $32,433, in-state and on-campus, before financial aid. Learn more about financial aid at http://northcentralcollege.edu/financial-aid. Estimate the net price for you at http://northcentralcollege.edu/financial-aid/estimate. The typical (median) early career salary of North Central College graduates is $39,000, according to Payscale. North Central College participates in the NCAA Division III for college athletics. Want more info about North Central College? Get free advice from education experts and Noodle community members.